Riviera’s newest models including four new boats are expected to generate considerable interest at the Sydney International Boat Show, showcasing the company’s revolutionary technology and international design flair. 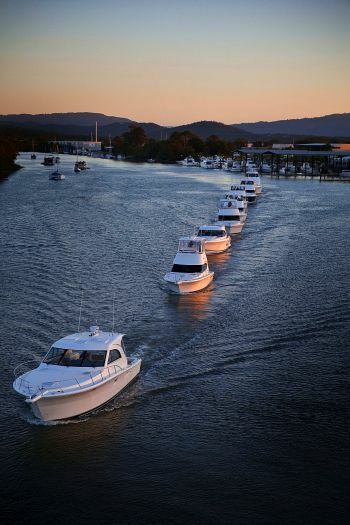 The fleet left Riviera’s Gold Coast manufacturing facility at Coomera this morning, heading south for the Sydney boat show that opens on Thursday, July 30 at Darling Harbour. The coastal passage from the Gold Coast Seaway to Sydney Heads is 380 nautical miles. The fleet are heading south towards forecasted 20 – 30 knot south easterly winds with a two to three metre swell during its run to Port Macquarie on Friday night before heading to Sydney for the boat show at Darling Harbour. Australia’s largest luxury boat builder will display 15 boats valued at more than $20 million at the Sydney International Boat Show, which is expected to attract more than 70,000 people to the annual five-day event. Among the 15 boats are four new models; the, 5000 Sport Yacht with Zeus pod drives, the 5800 Sport Yacht with triple IPS, 47 Enclosed Flybridge and 51 Enclosed Flybridge with triple IPS. 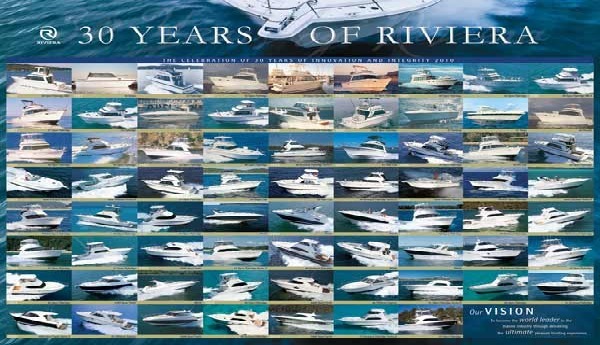 Sydney International Boat Show marketing and events manager Domenic Genua said Riviera was a long term supporter and exhibitor at the event. “This year Riviera will have the largest single display (2500m2) on the marina with an exciting exhibit displaying some of Australia’s finest boat building skills,” he said. Riviera CEO John Anderson said Riviera would unveil its latest step in the technology revolution with the launch of the new 5000 Sport Yacht. The 5000 Sport Yacht is the first production boat in Australia to be engineered with the revolutionary new Zeus pod drives. “We have strong expectations for the new 5000 Sport Yacht and we are sure that the Sydney market will embrace our new line-up of models,” said Riviera CEO John Anderson. “They are perfect boats for Sydney Harbour and for cruising the spectacular NSW coastline. The new 5000 Sport Yacht is powered by two Cummins Mercruiser Zeus pod drives. Zeus is an integrated system of marine diesel engines and steerable drive units mounted under the hull with twin counter rotating, aft-facing propellers. This system offers easy handling and manoeuvring even in tight situations and a joystick for easy docking. Cummins Mercruiser claim up to 30 per cent improved fuel economy as well as 15 per cent faster cruise and top speeds over conventional drive units. The exciting new 5800 Sport Yacht will be on show beside the 5000 Sport Yacht at the Sydney International Boat Show. The 5800 Sport Yacht caused a sensation during its launch at the Sanctuary Cove show in May, achieving multiple sales during the three-day event. “The success of the 5800 Sport Yacht launch demonstrates that the right boat excites the market,” said John Anderson. Riviera will also unveil its innovative new 51 Flybridge with triple Volvo Penta IPS pod drives. This model also features an entirely new flybridge design. Designs for the new range of Riviera Motor Yachts will be on display including the three new models – Riviera 73, 78 and 85 Motor Yacht. Members from Riviera’s Motor Yacht design and construction team will be on hand at the show to answer questions and discuss the exciting new range. The 42nd Sydney International Boat Show will run from July 30 to August 3. For more information, please go to the Riviera Motor Yachts home profile page.